They say that a picture tells a thousand words and this is something that I completely agree with. So what I am going to do in this article is take you through a walk that I did just recently from Little Manly Cove to North Head Sanctuary and back though the use of twenty eight (28) of the seventy five photos (75) that we took while exploring this great walk. Overall the return walk took us just on three hours and twenty minutes. This did include a stop off for coffee at the Bella Vista Cafe at North Head. As there are a few bush tracks, steel walkways, steep gradients in some of the roads, concrete and hand-made sandstone stairs you will need to be of a medium fitness to do the walk. But if walking is not your scene and you would prefer to drive yourself, that can be done very easily with a few stops along the way to take in the views, history, dinning, flora and fauna. The beach in Little Manly Cove is 200 metres long and has a boat ramp, small park, wire caged swimming pool, kiosk and rocks at either end. Our walk started from the boat ramp that is tucked in the eastern corner of Little Manly Beach and is a one laned concrete ramp that has parking spots for 6 car/boat rigs. Any more than that you will need to park somewhere in the street, which can be a real pain if you have anything more than a canoe, kayak, inflatable or car topper boat, or you are a local that has space somewhere to park your car and trailer. During a southerly blow you will need to take care as the swell will come up the ramp. The beach in Manly Cove is quite pristine and is a great place to have a swim, but you may prefer to swim in the enclosure of the netted pool. On the eastern side of the beach you will come across a set of stairs that will lead you up to the start of where the former Manly gas works were located on Manly Point. There are a number of gas BBQ's , covered picnic tables and the old timber loading wharf from where you can cast out a bait for trevally, bream, tailor and flathead. There are a number of picnic areas at Manly Point. Cast a line off the old wharf for trevally, bream and flathead. From here you walk up through the bush past Jump Rock and down a number of hand-made stairs to a small beach called Collins Flat. This small cove provides you plenty of protection from those northerly seas breezes and is a great place to more you boat while you go for a snorkel or swim. Whiting can be caught here during the summer months. Great place to moor a boat for a swim or snorkle. Collins Flat is a good place to get away from it all. They nearly had it all to themselves. Once you cross the beach and proceed up the stairs you will come to where the road starts for your walk up to the entrance of the North Head Sanctuary. This walk is what I would class as a moderate incline to the top and it can get very hot during the summer months. At the top you will come to a sign giving you directions of what is up there. I would suggest that you go straight to the small visitors centre and get yourself a North Head Sanctuary self guided tour pamphlet. It will show you the position of fourteen (14) areas you should visit while you are there. Maybe you could see where the Sergeant's mess and the Barracks were. There is parking and toilets available here. There is plenty of signage along the way. While there a few of the places we stopped at were the parade grounds, the Third Quarantine Cemetery, the lookout over looking north head, the Bella Vista Cafe for coffee and cake, plus the lookout to the north with spectacular views along the coast line to the north. While here you can also be on the lookout for lizards, birdlife, snakes and a large variety of native trees, bushes and plants. The main road in and out of the North Head Sanctuary is graced with a large sandstone arch. As we winded our way back down the hill we passed the Manly Hospital on our way back to the Little Manly Beach Kiosk to have brunch, a swim, sun bake for a while, before heading back home to have a nanna nap. 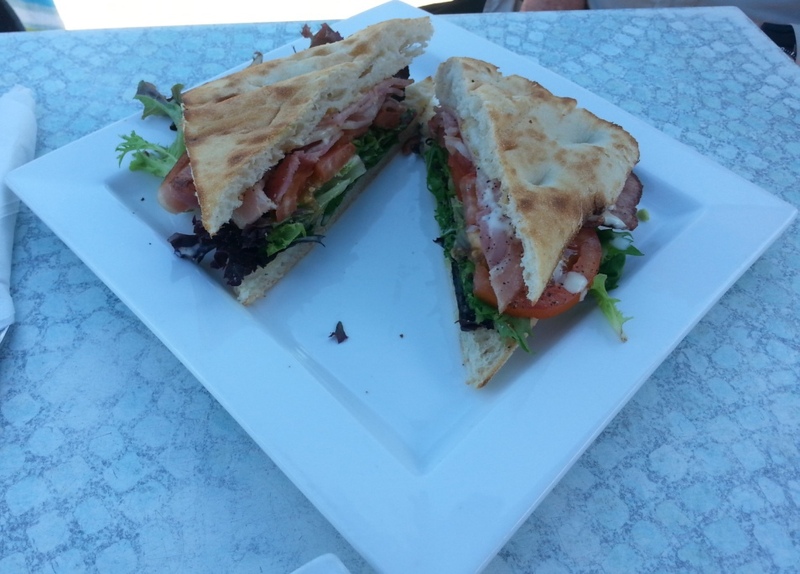 Who could resist one of Little Manly Beach Cafe's BLT. Dennis couldn't. Not one, but two ice cream boats. A quick swim before heading off. • Little Manly Beach Kiosk casual by day and restaurant by night. American, breakfast, British, brunch, burgers, diners, fast food and sandwiches. • North Head Sanctuary is a peaceful and pristine heathland - it can be easy to forget that you're only 11 kilometres from the CBD. As you explore, you'll encounter diverse wildlife and flora, military remains, and stunning views of the city and harbour. • The old Manly Gas Works Site at Little Manly Point was once an industrial site and is now a park. The Manly Gas Company's works originally produced gas here for anyone within five miles (8 kilometres) of Manly Post Office. • North Fort Cafe. You can pop in for a visit to Australian Bronze, located in building 19 near the Parade Ground, who are now offering fresh tea and coffee along with cakes and cookies. Open Monday - Saturday 9am - 3pm. 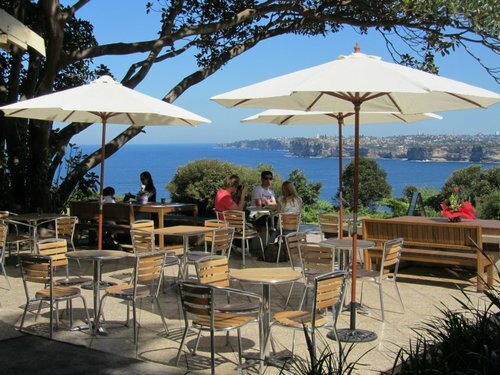 • Bella Vista Cafe is located inside the Heritage Listed North Fort Building at the picturesque North Head Sanctuary overlooking the majestic views of the Sydney Harbour. 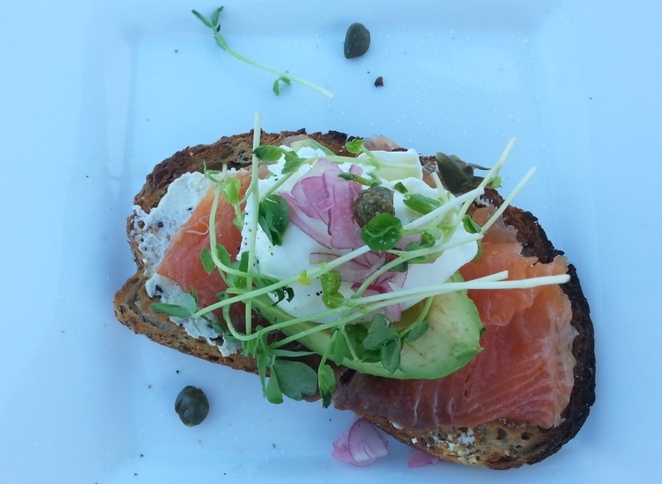 Bella Vista Cafe brings together delicious flavours of homemade traditional and modern Italian cuisine. The newly renovated cafe is the perfect escape from busy city life residing in the serene and majestic North Head National Park surrounded by beautiful wild life and flora. Open Monday - Friday 9am - 4pm, Saturday - Sunday 9am - 4pm. • Quarantine Station is renowned for its important place in Australian history, panoramic views of Sydney's incredible harbour, and location within the beautiful surrounds of Sydney Harbour National Park. Located on Sydney's Northern Beaches we are just five minutes from Manly and 20 minutes from the Sydney CBD. Q Station offers education, history, ghost and paranormal tours, hotel accommodation, is a conference and wedding venue, features a restaurant and bar as well as a cafe and exhibition, which is open daily. • The Gatehouse Visitor Centre is open from 10am - 4pm daily and is closed Good Friday, Christmas Day, and New Year's Day. That looks like one tasty BLT.